Growing strawberries (Fragaria × ananassa) requires some care, but the freshly picked, sweet, juicy fruits are worth the effort. Strawberries grow as perennials in U.S. Department of Agriculture plant hardiness zones 5 through 8, and in USDA zones 9 and 10 they're usually grown as cool-season, annual plants. Three kinds of are available: June-bearing, everlasting and day neutral. June-bearing strawberries fruit in early summer, everlasting varieties fruit in spring, summer and fall, and day neutral varieties bear fruit throughout the growing season. All three types grow best in full-sun sites and well-drained soils. Strawberries being collected in a basket. For the largest crop of fruits, grow strawberry plants in soil rich in organic matter and in a site that receives at least six hours of direct light per day. Space June-bearing strawberries 18 to 24 inches apart in rows 4 feet apart, and space everlasting and day neutral varieties 1 foot apart in a bed of two or three rows spaced 1 foot apart. June-bearing strawberries produce shoots called runners that root and grow into new plants on either side of their rows, creating strawberry beds 2 feet wide. Everlasting and day neutral strawberry plants produce few runners and these are removed, so they grow as single plants. Moist growing sites and fertilizer encourage strawberries to grow healthily. Strawberries need about 1 inch of water each week when the weather is dry during the growing season. Apply the water to the base of the plants, avoiding the leaves. 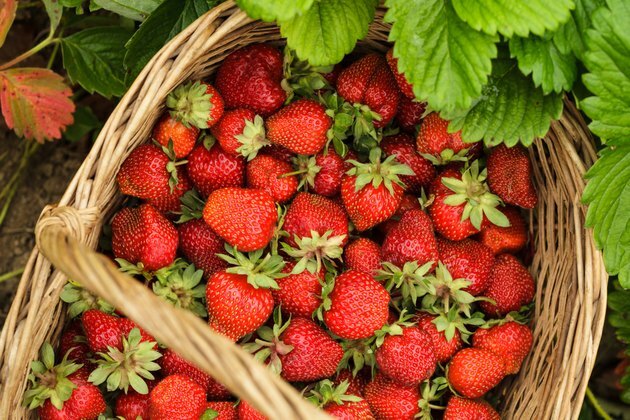 Over-fertilizing strawberries causes excessive leafy growth at the expense of fruit, but plants benefit from an annual fertilizer application after harvest. Dilute 2 tablespoons of a 10-10-10 liquid fertilizer in 1 gallon of water, and pour 1 to 2 cups of the solution at the base of each strawberry plant. Strawberries benefit from mulching, which suppresses weeds, conserves soil moisture and protects plants from frost. Remove weeds from around strawberry plants, and spread a 2-inch layer of an organic mulch such as garden compost or leaf mold, avoiding the plant stems. In areas where fall below 20 degrees Fahrenheit, spread a 3- to 4-inch layer of straw over plants in late fall. In spring, when young, yellow foliage appears, pull mulch away from the plants but replace it when frosts are predicted. Straw mulches can also be spread beneath developing fruit to keep it off the ground. General care for strawberries includes pruning blossoms and runners. Pinch the blossoms off June-bearing strawberries in their first season to encourage the plants to develop strong root systems and bear a large crop the following year. Pinch the blossoms off everlasting and day neutral types until early July, which helps the plants establish before putting energy into growing fruit. Prune the runners from everlasting and day neutral plants whenever they appear. Sterilize pruning shears by wiping a cloth soaked in rubbing alcohol over the blades, and cut the runners where they join the rest of the plant. Sterilize the shears again when you've finished. June-bearing strawberries growing as perennials provide crops for three or four years with annual renovation. After harvest, mow the strawberry beds to remove the old foliage. Set the mower blades to 1 to 1 1/2 inches above the ground. Rake off the leaves, and narrow the beds to 6 to 12 inches wide by digging out plants on both sides, and remove all weeds. Fertilize the strawberry plants with a granular or powder 10-10-10 fertilizer spread at a rate of 1 pound per 100 square feet, and mix the fertilizer lightly into the soil surface. Water the renovated patch for the rest of the growing season, applying 1 inch of water per week during dry weather.